Newly renovated post & beam family retreat. Four bedrooms each with a private bath. Sleeping loft extra bonus for kids. The perfect getaway for a family reunion. Three miles to Sugarbush lifts or golf course. One mile to Warren Village. Very private setting with you own personal 42' indoor heated lap pool, sauna, and steam room. All new furnishings and linens. New Vermont soapstone kitchen fully equipped. Private scenic setting. NEED 4WD TO INSURE ACCESS IN WINTER! House-broken pets will be allowed. Horse owners may use barn, stables and paddock in summer if attending horse show. This is our vacation home that we rent sparingly to other responsible families. We ski Sugarbush 50-70 days a season and love sharing our home when traveling to other resorts on business. We think the Mad River Valley is the best the East Coast has to offer all seasons of the year. 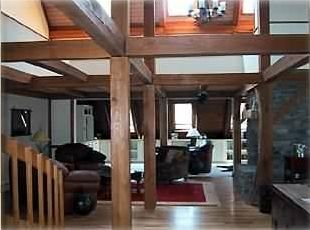 Very private setting yet convenient to Warren Village (1.5 miles) and Sugarbush Resort (3 Miles). On site trout fishing on private brook, dog friendly so families can bring the entire family along on vacation. World Class relaxing in the cool mountain air in summer, indoor pool for summer and winter use. Mini personal spa with steam room and sauna adjacent to pool. Radiant floor heating on first level. Hot water baseboard throughout the remainder of the house. Cotton sheets, towels, provided and made up for arrival. plenty of parking for up to six cars. High Speed Fiber Optics for quick uploads and downloading movies. Plenty of towels in each room and for the pool. Beach towels for swimming in famous Mad River swimming holes. Double sided Gas fireplace between the living room and dining room. Additional parking down at the barn area. Long distance calling is not blocked. Long Distance charges are deducted from deposit. fondue, racquelette, panani machines etc. Blender, Panni machine, waffle iron, etc. Everything you need for entertaining. Fully equipped kitchen for large family gatherings. Smart flat screen TV in family room. 2 addition flat screen TVs in master and living room. High speed fiber optic cable service. Most sports channels including Red Sox, NBC Universal. Great selection of reading materials. Fiction, Non-fiction and of course all the hard to find skiing history books. Foosball table in the downstairs family/TV room. Assortment of board games and puzzles for adults and children. CD player with 100 CD's loaded. 42' X 8' lap pool marked with turning T's. (2) 2 bedrooms have jacuzzi tubs. Bunk room has a single and Queen suite has a double tub. Great layout for families. The House is clean,cozy and inviting. We loved how close the house is to Sugarbush and the town of Warren. The pool and steam room were a hit with our group and the house was very comfortable, clean and updated. The Owners were accommodating and clear about how to use the amenities. It was a wonderful winter getaway for us and I can only imagine how lovely the property is in Spring,Summer or fall. Beautiful house and awesome host! I stayed here during the July 4th holiday weekend with my family and my brother-in-law's family. Between us, we have 4 adults and 6 children. I know the area fairly well since I've spent July 4th here for several years now and this has been by far the nicest home we've stayed in. The house itself is perfect and spacious for large gatherings and has all the welcome accommodations one could ask for including a working washer/dryer, multiple nicely appointed bedrooms and bathrooms, tons of extra towels and spacious living quarters. Every room has its own bathroom and the pool, while unheated during the summer, was a welcome place to dip into after a long, hot summer VT day. As soon as we walked in, we could tell the home is very well taken care of. Mike (host) and I exchanged a few notes via telephone regarding the pool and sauna and Mike was really responsive to any/all questions I had. While the road leading to the home is largely gravel /unpaved, after multiple trips to/from town, we grew used to it and loved the secluded nature of the home. Mike is great and the house is a gem! Not only is this house situated on beautiful hilly landscapes, it has two fields on opposite sides of the house, lending plenty of space for a round-table fire pit. Look for the lunar moths set against a starry backdrop. It's as if you could reach out and touch the stars, they appear so close. The interior is meticulously beautiful. The house spares no amenity, complete with large jacuzzi tubs in most rooms, stand-up showers, sauna and lap pool. The cozy warm decor is inviting with its log cabin design. The area offers many recreational activities. We were there for three nights and were able to get in cliff diving, rugged mountain biking and reservoir kayaking. Vermont in the summer is a well kept secret. Perfect sleeping weather with the temps in the 50's and 60's, while daytime temps hit normal summer highs in the 80's. So many outdoor activities it's hard to choose where to start each day up here! Soaring (Glider-Port) glider rides @ Sugarbush Airport, World Class Relaxing! Icelandic Ponies Touring.